I haven’t been exactly religious about my monthly ñoquis del 29 posts. Meant to bring luck, I try to get to it every month but don’t always make it. It’s a goal I set for myself so I can write my own hall pass when I’m otherwise distracted. Still, I wasn’t taking my chances on skipping January. I had initially thought I’d try gnocchi Parisienne as a follow up to my previous post, but exhausted from travel and deciding that gnocchi should be fun – a starchy puree of anything with only just enough egg and flour added to hold it together – I went pear shaped instead. I’ve been so focused on waiting out the frost to a (hopefully) early spring that I hadn’t taken advantage of the winter fruit I’ll be missing soon enough – specifically, crispy, grainy Bosc pears drizzled with honey, covered with Gorgonzola and sprinkled with thyme. As I working out the recipe, I worried that the pears would be too watered down once they were pureed. I considered grilling them and adding them afterward but egged on by a co-worker that they wouldn’t really be pear gnocchi. This time it wasn’t my rule but I do like a challenge. I kept looking for a way to incorporate the pears when I found this version of mashed potatoes that included pears. Lightly coating the pears in butter and honey, I baked them alongside the potatoes then ran them through the food mill together. Once I had my puree, the rest was pretty simple. I tried to cut back on the amount of flour I used so they weren’t as firm and evenly shaped but a little more tender. For the sauce I made a quick béchamel with sweet gorgonzola. I had wanted to add prosciutto as well but was so relieved that the gnocchi held together that I completely forgot. Maybe next time. Combine honey, lemon juice, and butter in a mixing bowl. Add pears and toss to coat. Remove with slotted spoon and place to one side of prepared baking sheet. Pierce russet potatoes in several places with a fork and place whole on the other side. Bake until tender, 45 minutes to 1 hour. Cool potatoes slightly then peel. Force potatoes and pears through ricer or food mill onto sheet pan, spreading in an even layer. Cool potatoes and pears completely. Beat together egg, nutmeg, 1 tsp salt, in a small bowl. 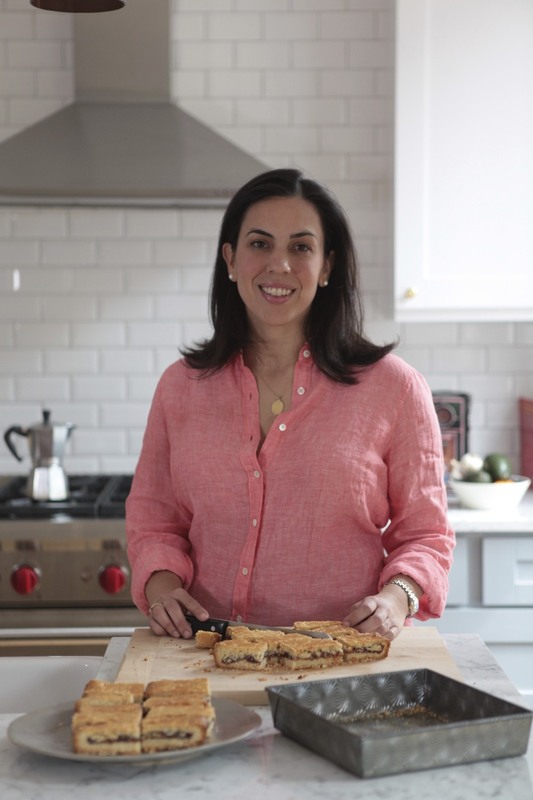 On a lightly floured board, gather potatoes/pear mixture into a mound on a sheet pan, using a pastry scraper if you have one, and form a well in center. Pour egg mixture into well, then knead into the potatoes. Knead in 1 cup of flour adding more flour as necessary, until mixture forms a smooth but slightly sticky dough. Dust top lightly with some of flour. Cut dough into 6 pieces. Gently roll each piece into a ball and lightly dust with flour. Repeat with remaining 5 pieces of dough. Chill dough for about 30 minutes. Form 1 piece of dough into a 1/2-inch-thick rope on a lightly floured surface. Cut rope into 1/2-inch pieces. Add half of gnocchi to a pasta pot of well-salted boiling water and stir. Cook until they float to surface, about 2-3 minutes. Transfer with a slotted spoon to a bowl or serving platter. 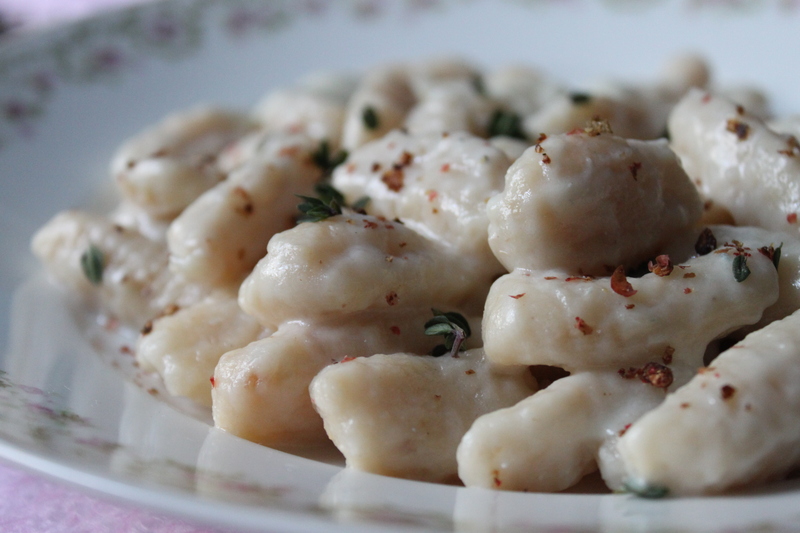 Cook remaining gnocchi in same manner, transferring to platter as cooked. Top with gorgonzola sauce and sprinkle with thyme and freshly ground pepper. Melt the butter in a heavy saucepan over medium heat. Add the flour and cook, stirring constantly until well incorporated, about 4 minutes. In the meantime, gently heat the milk until hot but not boiling. Gradually stir in the milk, turning constantly until the sauce has thickened slightly. Add the Gorgonzola and stir until its completely melted. Season with freshly grated nutmeg, salt and pepper. Mmm, these look incredible! And incredible decadent. 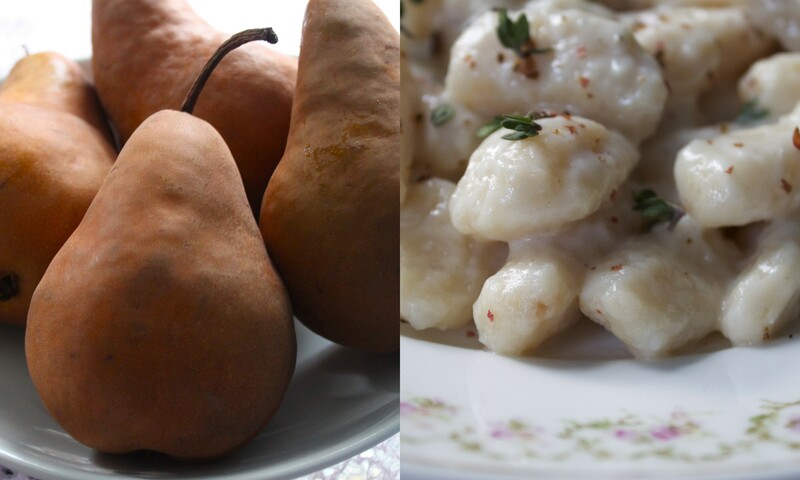 I would have never imagined to make gnocchi with pear but what am amazing idea! This looks delicious. Oh my god these look amazing. 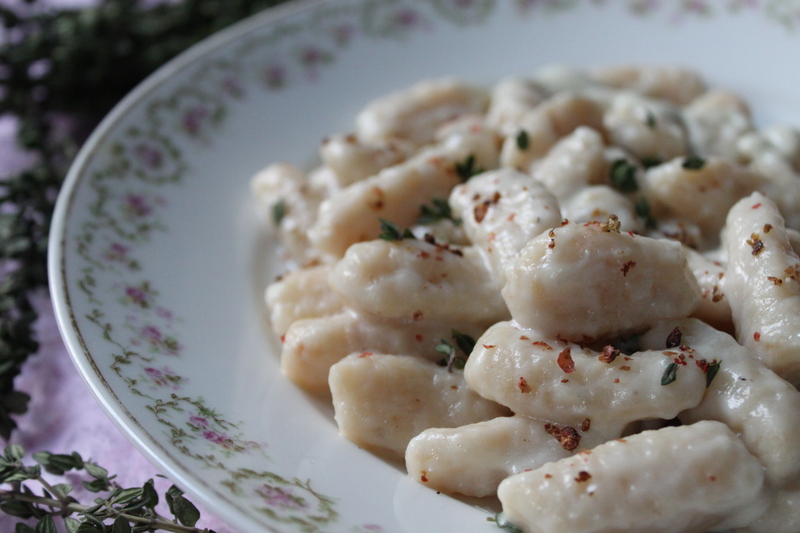 I would never think to add pear to something like Gnocchi, but i love sweet and salty combinations, and this looks delicious. I can’t wait to try it for myself. This is genius! I need to try this! This looks so delicious! 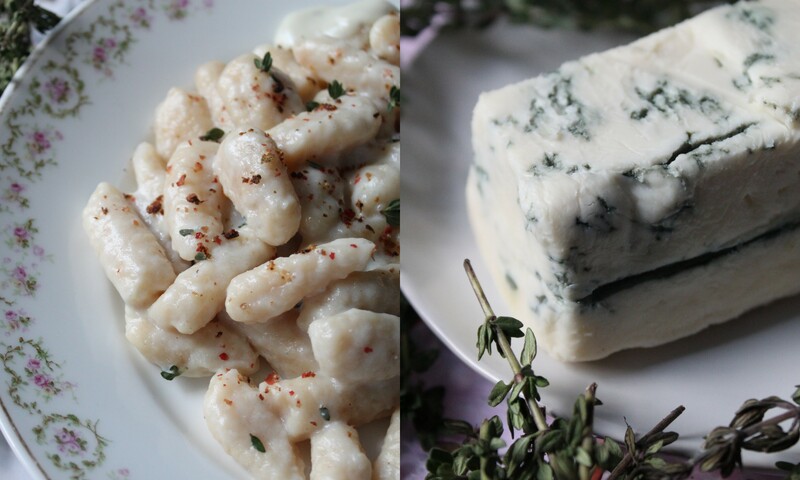 I love the combination of pear and gorgonzola, may have to try this out soon. Thank you so much for sharing! Wow, pear gnocchi! How creative!